Hobie Alter (Yes, that is his real name!) turned a ‘fun’ endeavor in the 1950’s into a huge board business that now spans the globe. Hobie stand up paddle boards are highly sought after. In the article below, we take a closer look at a variety of Hobie boards available on the market today. Hobie did an interview with Surfermag and is a pretty interesting read if you are interested in learning more about the man and his business. The tour inflatable is one of the toughest iSUPs on the market. Suppers have tested the Hobie Tour board in the Indian Ocean for many weeks and found that it just plain refused to crack under extreme use and continued to impress us. You can inflate and deflate this board multiple times a day with no issues at all. It is crazy tough. Gear bag that can hold everything above. It weighs 28 pounds with a width of 32 inches fully inflated. This is mainly a recreational SUP and would not be a competition style board. With these points made, the Tour Inflatable is actually a pretty good value for money at this price. Because It is an inflatable, it can double as an inflatable mattress if you so choose for camping. 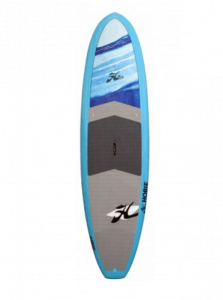 This board is very stable for flat water boarding and is ideal for beginners. You could also use this for mild whitewater due to it being as stable as it is. This can seriously withstand a tremendous wear and tear so I wouldn’t worry about hurting it if you are considering an inflatable SUP. This Stand Up Paddle Board is one of the Hobie Race RAW series. It’s construction uses a ESF Technology that is made with fibers a lot like Kevlar. The end result is an extremely tough and durable board due to fact that the material is 8 times stronger than steel and makes nylon and fiberglass look weak! If you take a closer look at the board, you can see the amount of detail that has been put into it. The Apex has a center box for a single fin and a EVA traction pad for a soft comfortable feel. There are even extra plugs on the board for optional handles in case you want to instal them to punch through the surf easier. Seeing how the Hobie Apex is a custom board, it may not fit everyone, so you may want to look for a wider board or a narrower board depending on your needs. Hobie designed the apex for easy transportation. This board is definitely more sooted for the experienced rider and with the price being around $2,000, you may have to weigh your options before you pull the trigger on it. High performance is what it is built for. 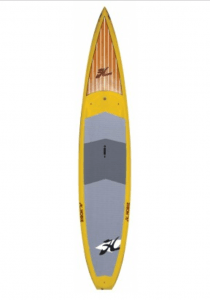 This board is one of the ‘Recreational’ Hobie board lines and is an extension of its CM Raw Series. This Hobie paddle board is mainly designed for a larger individual who is looking for a little extra stability in a board. The board comes in a few sizes: 9’, 9’8” and 10’6” so that you can pick and choose to fit. This is also one of Hobie’s board series that legendary Colin McPhillips has endorsed and decided to put his name on. The 9’ version is ultra light and only 30 inches in width. It includes a nice deck pad, hand hold, deck plugs, leash port, and vent plug. The board is constructed of bamboo and epoxy so is really durable and can take a harder hit than just your standard fiberglass board. The CMLB has a nice deep concave in the front of the board, so it planes nicely and makes hard quick turns simple and easy. The one downside to this board is the stability. It is a little harder to balance on compared to most paddle boards on the market, so if you need a more stable board, this is probably not the best board for you. 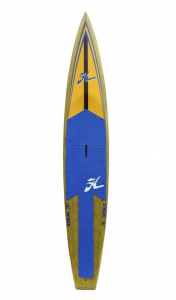 However, if you are after a high performance board that you can really snap off the lip of a wave, then the Hobie 9’ CMLB is what you may want to buy and it comes in around $1,399. Like all Hobie boards in the Elite series, this paddle board has been tested and developed by world class boarders. Hobie really made an effort with this board due to the amount of extreme testing it has gone through. One of the main athletes involved in the rigorous testing of the Elite Flatwater SUP is Byron Kurt. The Elite is extremely fast and smooth in all conditions, even choppy waters and bigger surf. It is said to be one of the best all-around racing and touring boards on the market today. 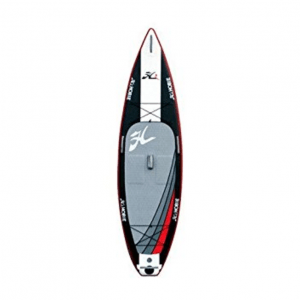 What surprises most about Hobie Elite is its ability to be fast but still so stable at only 28″ wide. Because the board glides so well and offers superb stability, you can let a little loose and give more power to your strokes with deeper sweeps and you can worry less about keeping your balance. After testing the Elite, you will soon find your ‘sweet spot’ and be able to focus more on riding rougher conditions. At $1,900, this board isn’t such a bad deal considering the quality.